The end of domestic violence support for black and brown women in the UK? Dedicated refuges were created to answer a desperate need. Now their survival is at risk. Balancing her baby daughter on her lap, Leah* sits in a bright room on the top floor of an East London office block. It’s a lively part of town. Newly built luxury flats tower over streets lined with decades-old black beauty shops, one-stop mobile phone stalls. The storefronts of family-run greengrocers are piled high with yams and bowls of okra, peppers and coriander. Leah is waiting to get help and advice from Latin American Women’s Aid. They’re a small charity challenging violence against women and working with survivors of domestic abuse. They rent three rooms — one for an office, a crèche space for children and a place to see women. Lawa, as the group is widely known, opened in 1986 and they run the only domestic violence refuge for Latin Americans in the UK. 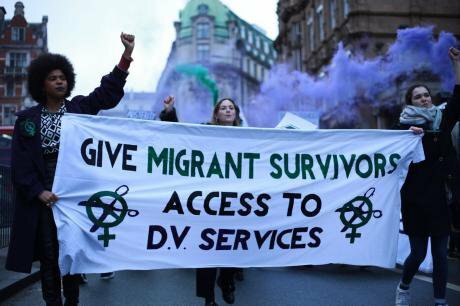 Like other refuges and organisations set up in 70s and 80s Britain, they arose from radical women’s rights and anti-racist movements. Domestic violence shelters specifically for black, south-Asian, Chinese, Latin American and other ethnic minority women, now bundled under the term BAME, were founded because these women weren’t getting support from statutory or mainstream places. Sisters Uncut block city bridges across the UK ahead of govt. spending statement. Photograph: Guen Murroni. All rights reserved. Decades on, by the time the Coalition government made deep cuts in public spending in 2010, many BAME domestic violence organisations, including Lawa, relied on council funding to pay for part, if not all, of what they offered. Bed spaces, English as a second language classes, counselling, childcare, time intensive advice work, court assistance. But in the past six years, cash-strapped local authorities have cut back frontline domestic violence services, diverting money from small specialist providers and awarding contracts to larger organisations making promises to deliver more for less money. Each year Women’s Aid surveys the state of refuge and service provision, each year the numbers are worse and each year brings news of another refuge closed. It is a Tuesday when Leah visits Lawa’s drop-in session, and already she is dreading the weekend. Leah is 25 and lives in a two-bedroom flat with her husband Gabriel*, her baby and four other adults. Alejandra, one of Lawa’s case workers, sits across from Leah, taking notes at a table between them. Leah tells Alejandra that she needs housing advice— that’s the purpose of her visit. But as Alejandra listens, another story emerges. Originally from Guatemala, Leah and Gabriel have lived in the UK for little over a year. Like nearly half of all Latin American migrants in London, Leah’s husband took an unskilled job. He cleans nine hours a day, and earns roughly £1,300 each month. Most weekends he drinks heavily, using alcohol to ease the disappointments of their life in London. “No.” Leah shakes her head, still smiling. He is frustrated, she adds, the housing situation is unbearable and the family struggle to survive on his wages. It’s a familiar story to the women running Lawa. Men forced to work long hours in menial, ‘feminised’ jobs, become violent and abusive towards their wives. In Leah’s case the abuse is verbal. Malicious comments, name calling, heated arguments over money. Except the one time he grabbed her by the throat. Waterloo Bridge, London. Photograph: Guen Murroni. All rights reserved. Between 2001 and 2011 Britain’s Latin American community grew fourfold. And though Latin Americans are not officially recognised as an ethnic minority, they experience the harassment, employment discrimination and problems that affect other minority groups in the UK. There are high employment rates for Latin Americans in London (85 per cent compared to the average for other foreign-born residents, 55 per cent), but much of that work, around 70 per cent, is concentrated in cleaning, hospitality and catering, despite professional training and experience acquired in their home countries. They face discrimination at work, 11 per cent are illegally paid below the minimum wage and the majority send a significant chunk of their low incomes back home. As with other poor and even middle income households in London, it is impossible to find decent housing, close to the centre where many of them work cleaning corporate buildings. These are the conditions revealed through research by Trust for London in the 2011 report No Longer Invisible. Few Latin Americans in London access public services, the report says, one in five never visit a GP. The restrictions on legal aid for poor migrants means few can get legal advice to regularise their migration status to access the full range of rights citizens receive. Settling into British life is difficult because of the unsociable hours in the typical jobs available, like cleaning and hotel work. English as a second language lessons are most likely to be during work hours or when people need to sleep because they work nights. When a woman in this community faces domestic violence, her experience intersects with the other problems she faces as a disadvantaged minority. The threat of homelessness, poverty, childcare, immigration, language needs, among other things. 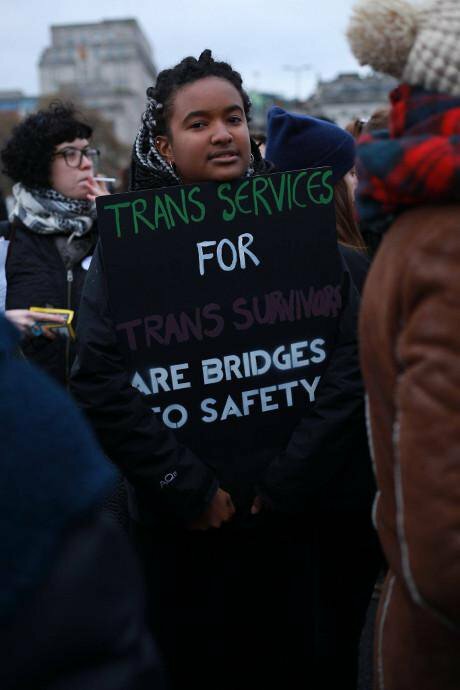 Around 600 women and non-binary people took part in Sisters Uncut actions in Newcastle, Bristol, Glasgow and London. Photograph: Guen Murroni. All rights reserved. Lawa has changed over the years as more Latin Americans have arrived in London, mostly from Brazil, Colombia, Ecuador, Bolivia and Peru, and often via Portugal or Spain. As Home Secretary, Theresa May promised to create a hostile environment for migrants, and migrant women fleeing violence were no exception. Many of Lawa’s cases are “European Economic Area cases”, that is Latin American women with an EU passport from Spain or Portugal. Lawa sees women who flee to the UK after some sort of crisis, abuse by a relative or spouse. Or the women might be living in the UK on a spousal visa, linked to their husband’s British/European Economic Area status. In both cases Home Office rules restrict their access to public services, which means they are more likely to be destitute, homeless and vulnerable to exploitation and further violence. Women can apply to have the restriction lifted, but the threshold for proving violence and destitution, thus entitling them to public support, is high. The recent changes to immigration law have created a culture of suspicion among public sector professionals who aren’t always sure what foreign born women are entitled to and so lean towards refusing services or charging for it. One of Alejandra’s clients lives in the UK on a spousal visa. Originally from Colombia, she is married to a British man. He’s ex-Army, has access to guns that he uses to threaten her. She wants to leave, but her spousal visa comes with the condition that she has no recourse to public funds. Alejandra found a bed for her at a shelter that accepts ‘no recourse’ women. She is lucky; there are few such refuges in the country. The next step is securing a non-molestation order to prevent the husband from contacting her. This is expensive — they’ll need legal aid. Even then, it’s a tall order. She’ll need to prove destitution and provide evidence of the domestic violence. This involves gathering and collating GP letters, a marriage certificate, passport, bank statements and evidence from the refuge. If and when legal aid is secure, Alejandra can go ahead and apply for the non-molestation order. All this could take weeks. On the day of Leah’s visit, Victoria is working across the corridor in Lawa’s office on the phone, trying to reach a local GP. Other Lawa staff dash in and out, speaking in Spanish and English, to each other and on the phone to clients. Camilla, Lawa’s counsellor, has just secured a grant to expand the charity’s mental health support next year. Nayane, originally from Brazil, rushes out to help an Angolan woman, who has arrived with letters from the Department for Work & Pensions stopping her grandson’s Disability Living Allowance. She is his sole carer and unsure of what to do next. Nayane gets on the phone to the DWP. Without the letter, they might not secure legal aid, which the woman needs to fight her husband in the family courts for custody of their children. In the worst cases women are deported, made homeless or forced to stay with their abusive partner. "You block our bridges, so we block yours." Rallying cry at feminist direct action protest against cuts to DV services. Photograph: Guen Murroni. All rights reserved. About that £20m funding pot from the government. 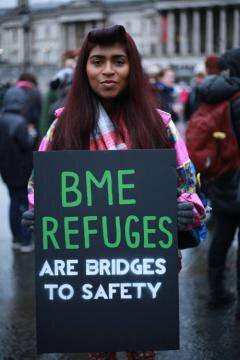 The design and structure of the commissioning process may block access to the groups who serve “BME victims and those from isolated communities”. Groups like Lawa. Earlier this year, research among charities based in London where around 40 per cent of the population is from an ethnic minority, revealed a profound lack of trust in the people who commission services. 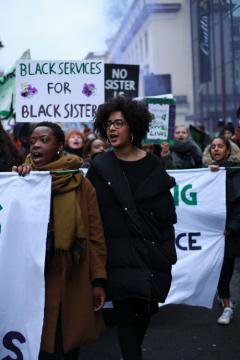 Imkaan, a black feminist network of violence against women and girls organisations, reported that many of its members felt local commissioners did not recognise the importance and necessity of BAME services. 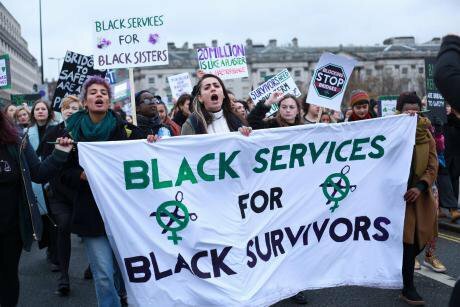 One of Sisters Uncut demands is comprehensive DV services for all, especially underserved communities of black and brown, disabled and LGBT+ survivors. Photograph: Guen Murroni. All rights reserved. More than one politician said they feared BAME specialists services would not survive. Sarah Champion, Labour MP, spoke up for Lawa and for Apna Haq, a small domestic violence charity in her own constituency of Rotherham. “Such dedicated services are vital for women,” she said. “They are experts in their provision, designed and delivered by, and for, the users and communities they serve. The women who seek shelter see themselves reflected in the staffing and the management of the services. But what if that support is taken away?